Of late, whenever I serve Joel his food, he tells me," Wait, I need to take a picture." Then he pretends to take a picture of the food with his pretend camera and shows it to me, asks me how it looks and then proceeds to eat. So much for having a food blogger for his mom! 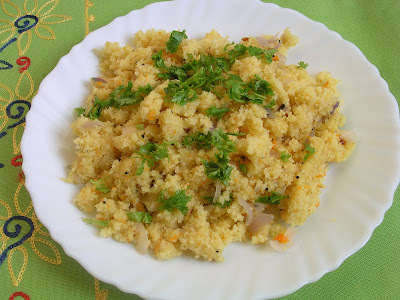 Upma is a classic South Indian breakfast preparation. A great way of including a lot of veggies and a filling dish to give you a headstart for the day. 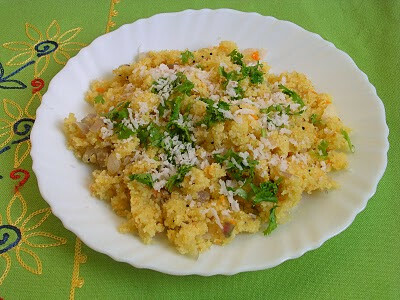 I usually include tomatoes and peas as well, but hubby prefers his upma without them. However I've included them in the recipe for you, though you dont see them in the picture. Roast the semolina in 1 tsp oil and keep aside. Heat oil, crackle mustard seeds. Add the minced onions, chilli and ginger and saute. Add all the vegetables, cover and cook. Add the water and let it boil on medium flame. Add the salt. Taste and check at this point. Reduce the flame and drop the roasted semolina slowly stirring all the time, so that lumps do not form. Mix all the veggies well and when the semolina is cooked take off the heat. 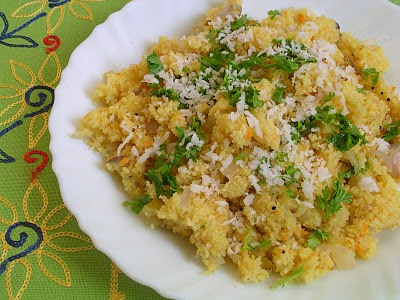 If you like the grated coconut as well, here's what it will look like. That's an interesting and different kind of breakfast that I need to try. The semolina looks like couscous....and its an interesting combo...with the coconut, it'll be delish! Yeah, I did the same thing as well! haha... Sometimes, my son would asked "mom....can I have it now?"... "OK OK, just one more minute!". Btw, this is quite an interesting breakfast! Your son loves it too? Never tried this before but sounds good and beautiful breakfast. I love these super savory Indian breakfasts! they seem so much healthier and more sensical than the sugar-filled cereals that we eat. Sounds delicious! This looks interesting....refreshing colour and look delicious. I would love to have some roasted chicken to go with it for lunch. I like discovering breakfast foods. I'll let you know when I try it and how it is received. This recipe looks absolutely delcious! Incredible picture and I am sure taste out of this world! Ha... too funny... my husband is the one that always wants to take a pic of the food I serve him! Matter of fact..the other day he made himself a salad and was so proud...wanted to take a pic! Ha ! I know that so well! My husband runs for the lights and camera the minute something goes on the table. This looks great Shirley! Haven't tried this before, would love to. Before I could try this, my daughter was over. She saw the recipe posted on my refrigerator and got excited. She frequently eats semolina upma for breakfast. When she left, she had my bag of semolina so I still haven't tried this. Someday.